The Team Trophy started back in 1965 where you can see from the chart below the Webster Ski Bees, primarily a Show Ski Club even back then were a contending power house for this trophy for 9 years running. Each year at the Indiana Water Ski Championships there is a stiff competition between ski clubs vying for the State Team Trophy. 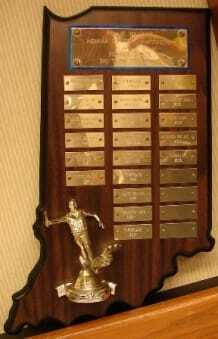 The team trophy is passed around from year to year to the team that scores the most team points. For a skier to be part of their team each team member has to be a part of that ski club. The points from each competing team member shall be calculated as such and totaled to obtain the team score.